Cliff Barackman has published another detailed-rich Finding Bigfoot Field Notes. His latest post is based on the recent Canadian episode which originally aired on January 23rd, 2012. Below is a short excerpt covering the Todd Standing portion of Cliff's notes we recommend reading the whole thing At Cliff Barackman's Official Blog. 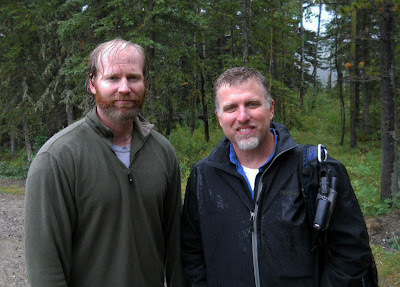 Excerpt from Cliff Barackman's post "Finding Bigfoot - Alberta, Canada Field Notes"
"Todd is a very polite and well-spoken man. I genuinely liked the guy, as well as his message regarding sasquatches: protect them, and let them be. He has taken great strides to increase the public's awareness of bigfoots through his actions. While these actions are labeled as self-serving by his critics, the fact that attention was brought to sasquatches is undeniable. Todd currently lives in Calgary, but he lived several hundred miles away when he obtained his videos at Sylvanic. He told us that he could not take us to the actual spot because it is a three-day hike back to this secluded valley, and the last day would be spent belly crawling up a river bed in a specially designed gillie suit made by Todd himself. He went on to say that nobody wants to be back there because of the problem grizzly bears that inhabit that area. He claimed that the rangers say there is a 10% chance of being killed by a bear while in the area, and it was too dangerous to go. It seemed to me that a bunch of hurdles were put in the way of anyone wanting to see the location for themselves. Todd did offer to take anyone there who wanted to go at a later time, but it would take a week or two for the trek. Questioning Todd, I soon learned that at this time he had five videos that had bigfoots in them. The first video is apparently only a sound recording with no images of sasquatches (I didn't get to hear the recording). We investigated video number two, with the creature quickly bending over out of sight while above Todd on a hill. His third video shows what is either a bigfoot or a man in suit running on a hillside. This creature is the same brownish orange color as the creature in video number two. Video number four is a close up of what appears to me to be a bigfoot puppet behind some branches. Its dark eyes stare unblinking off to frame right, and there is very little movement visible. The skin appears very much like felt, and its fur lacks the flow pattern that one would expect from a living creature. Video number five is a similar shot, but with a much more convincing bigfoot head. It slightly resembles Patty from the Patterson/Gimlin film, but with a rounder face and more dog-like nose. Over the last month or so, there seems to have been another still released showing this same head, but possibly from another film. I asked Todd what was up with video number four, the one that looked like a Muppet head. He said that he does not know why it looked so bad. He suggested that the lighting might have made it appear that way. We were to be investigating his second video, the one with a brief glimpse of a creature bending down facing away from the camera. The video is very brief, but it seemed that it showed something bipedal and hairy. An arm and even possible buttox muscles can be seen, or are at least suggested. We were to rely solely on Todd's measurements since we were unable to go to the actual film site. This would be problematic for our reconstruction, as going to the actual film site is very important for a sense of scale. Trusting someone's measurements when you're trying to find out if their film was hoaxed makes little sense anyways, but it's all we had to go on. Questioning Todd further, we found that he was unaware of the elevation of the Sylvanic location. He said that he never paid attention. This, if true, would be a very dangerous thing to ignore, as we would soon find out during that night's investigation (it snowed on us in August). How could Todd have chosen a location, planned his hikes in (most likely using topographic maps), visited a dozen times, and not noticed the elevation? This seems very unlikely. When investigating a film, I sometimes think of the late Rene Dahinden and his comments on the Patterson/Gimlin Film. He said that what you need to know is in the film. Certainly, Rene would think that the context of a film is very important, too, but I like to examine films starting with what is actually seen. Good films stand on their own, and their context only serves to reinforce or put in doubt a clip's authenticity. With so little to go on for video number two, I am left with not knowing what is in it. The film looks like either a bigfoot or a guy in a suit bending over. Since there is very little information to be gleaned from the actual video, I have to rely on the context. Todd was unable or unwilling to go to the actual spot, there were inconsistencies in his story surrounding the clip, and there's that Muppet face staring, unblinking in film number four... These leave me with serious doubts about what is shown in any of his videos. Expressing my concerns to Todd, he correctly stated that video will never be enough for proof. How true. Todd goes on to say that only a body will ever suffice. As much as I hope this isn't the case, it could very well be the grizzly truth at the end of the bigfoot mystery." I have to agree with your assessment though I would be as nice about Standing and his story. I mus disagree however that a video or any video will never be enough. What is need is Credible video . Not videos of Bigfoots frolicking in fog banks, or in out of focus areas , or behind rocks and trees for just a few frames. In the end physical evidence will have to be obtained to classify and determine what they are but a credible clear video would set the ball rolling in the right direction if someone can ever get one. He claims a credible video could actually be compelling evidence. You can say that Todd Standing is a Hoaxer along with many in the "Bigfoot research field". However, compared to others, he knows "the ways of the woods" better than most others. He know to travel light, not carrying alot of gear, he moves fast (when he needs to), and seems to really know the habits of "Bigfoot family groups" that put out "Watchers" to protect their group. he knows the "little things" like Chick-a dees chirping sending out a warning signal to "all animals", that a human is in the woods. His knowledge is more that I can say about "The Team" from finding bigfoot who never,ever mention the "Day Watchers" because they are busy "bumblying around the woods at night"(Stupid) This "Team" doesn't realize that they are "spotted" (Along with 15-20 support people)before they step 3 feet from the road. When one is discovered (Proven) it will be by a "low-tech woodsman' using sound hunting methods, Fat, "Out of shape" Matt Moneymaker is jealous of a guy like Todd so he is willing do everything to discredit him or others. I would never let "The Team' anywhere near my "Bigfoot hotspots" either! With their "stupid methods" Bigfoots in my area would run right out of my state! I can't wait to see Moneymakers or Biscardi's reaction when "someone else" proves their exsistance.